Riga, the capital of Latvia, for travelers is a city most famous for it's extensive Art Nouveau architecture as well as it's historical skyline of medieval church spires. There are many other architectural gems in the city, surprising urban spaces from picturesque Old Town squares and small streets to impressive, metropolis-style street scenes of 20th Century beginning. 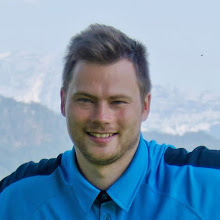 Here is a list of most notable sights of Riga - from major buildings, most magnificent streets and main squares to most beautiful parks and the best panoramic observation points. RIGA CATHEDRAL (DOM CHURCH). 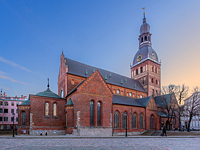 The largest church in the Baltic states presents various architectural styles from eight centuries and is one of the most important landmark buildings of Riga, almost as old as the city itself. NATIONAL OPERA HOUSE. The Neoclassicism building was built in the middle of 19th Century as a German-speaking City theatre but in the independent Latvia state it houses National opera. HOUSE OF BLACKHEADS. The splendid House of Blackheads - a replica of original building which was built here in 14th Century for unmarried German merchants is one of the most photographed and tourist visited places in Riga. SAINT PETER'S CHURCH. One of main symbols of Riga skyline, the highest church in the city (121 m) and until World War 2 it's tower was the highest wooden construction in whole Europe. 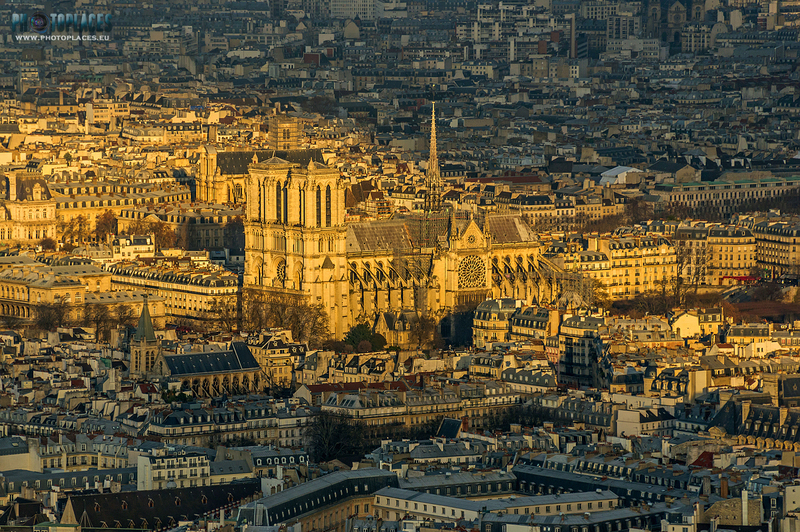 The church contains Gothic, Romanesque and Baroque architectural styles, it offers also panorama observation platform (see Observation points section lower). RIGA CASTLE. Riga medieval castle was built in 14th Century as a residence for the master of Livonian Order. The castle has gone through many transformations since then and has recently been renovated. FREEDOM MONUMENT. The symbol of Latvia's independence was built in 20th Century 30ies as a devotion to soldiers who died in Latvian Independence War. NATIONAL ART MUSEUM. The grand, palace-like building of Latvian National art museum is one of last Ecclecticism buildings in Riga (1905) and the first in Baltic states which was built for the purpose of museum. Recently experienced total renovation as well as underground expansion. NATIONAL THEATRE. Another Neo-Baroque version of Historicism, National Theatre building was built as a theatre in 1902 and is still the theatre today. It has a special place in history of Latvia - exactly here independent Latvia state was founded in 1918. NATIVITY OF CHRIST ORTHODOX CATHEDRAL. Impressive Neo-Byzantine style cathedral with 6 cupolas, two of them gold-plated. It was the most expensive building in Riga at the time when it was built (1883). CENTRAL MARKET. Unusual structure - five huge, semi-rounded hangars (Zeppelin hangars from WW1 time) which houses the largest market in Europe, probably the only market "for the masses" which can still compete with supermarkets in this part of the world. NATIONAL ART ACADEMY. Large, architecturally interesting Historicism "castle" built from bricks in 1903 as a commercial school, since 1940 the Mecca of art students. Neo-Gothic style was chosen as the best to represent Riga as a historical Hanseatic city. ALBERTA STREET 4. 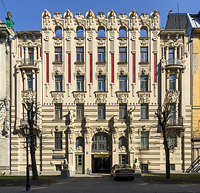 One of the most famous Art Nouveau masterpieces in Riga, designed by Mikhail Eisenstein. 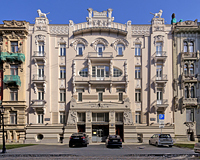 Some elements on it's facade are inspired by Vienna Secession building, nevertheless it's often labeled as the most original and outstanding example of Riga's Art Nouveau. ALBERTA STREET 2A. Another Art Nouveau pearl of Alberta street which can hypnotize it's observer. The surreal impression is achieved by fake 5th floor - the empty window openings which offers view to the sky but tourists love to take selfies with sphinkx sculptures which are situated in the front of the building's entrance, on the pavement. ELIZABETES STREET 10B. Another one of the most iconic art nouveau buildings of Riga. Huge sculptural faces which tops this building's facade is often used as a symbolizing picture of Riga from tourism brochures to art history books. THREE BROTHERS. These unusual looking buildings are the oldest complex of dwelling houses in Riga, the oldest one of them built at the end of 15th Century. SMALL GUILD. One more treasure of Neo-Gothic style, a rebuilt older house of Riga's craftsmen guild (in 1866). SWEDISH GATE. The only preserved gate of Riga fortification wall (there were eight of them in total). The gate was made in 1689 when a passage was built right through the dwelling house, in order to join the inner city with Swedish army barracks outside of the city wall. POWDER TOWER. The main fortification tower in medieval Riga - this version was built in 1650 after the previous tower was destroyed by Swedish army which attacked the city in 1621. RIGA TV TOWER. The 3rd highest free-standing structure in Europe (368 m) and one of the best soviet time architecture examples in Riga. Traingle-shaped television and radio tower has unique and good looking design. There is also an observation platform to see the city from above (see Observation points section lower). NATIONAL LIBRARY. The newest landmark building in Riga was opened in 2014 after 25 years old project made by one of most internationally famous Latvian architects Gunars Birkerts. The building symbolizes "Glass mountain" which is motive in the work "Zelta zirgs" of Latvian poet Rainis. SWEDBANK OFFICE TOWER. World-class architecture design in the first modern highrise in Riga. It was built on the opposite Daugava river bank to Old Town in 2004. ZIEMELBLAZMA CULTURE PALACE. Large culture palace in Art Nouveau style, built in 1913. The first reinforced concrete building in Latvia. DOM SQUARE. One of the most beautiful squares of the city which hosts main Christmas market and many public events (concerts, political gatherings, etc.). The square is surrounded by great architecture - largest cathedral in Baltic states, Museum of foreign art, Latvian Radio building, etc. TOWNHALL SQUARE. Main historical square, administrative, cultural and political centre of Riga from medieval times until 19th Century. Here tourists gather to wonder about House of Blackheads ornated building, Townhall and Roland statue. CENTRAL STATION SQUARE. On the square in front of Central station one can take a look at two timepieces - the sun clock which shines also at night (due to LED lamps accumulated sun energy) and Central station clock up in the tower. ALBERTA STREET. Unique area of Riga with excellent Art Nouveau buildings. One can observe an unimaginable flight of fantasy of the weird faces, animals and decorations on the buildings' facades, designed by famous Art Nouveau master Mikhail Eisenstein. ELIZABETES STREET. 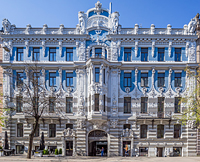 One of the most luxurious and architecturally richest streets in Riga - buildings in it's northwestern part are mostly renovated embassies in Ecclecticism style, further - some of the best Riga's Art Nouveau examples. BARONA STREET. One of the most impressive streets of historical centre, 3 kilometres long street filled with many grand and interesting buildings as well as shops, cafes and other signs of urban vitality. GERTRUDES STREET. Most beautiful part of this street is the area around Old Gertrude church. 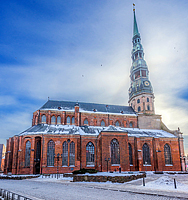 It is one of the most scenic Riga churches and it's surrounded by several wonderful buildings from the beginning of 20th Century. TROKSNU STREET. The most narrow and very charming street in Riga Old Town, leading along former fortification wall with old, authentic houses and some beautiful courtyards. TORNA STREET. Torna street is located parallel to Troksnu street, on the outside of medieval Riga border. It stretches next to once longest building in the city - Jacob's barracks which now houses exquisite restaurants, cafes, shops. OPERA GARDEN. The charming garden in front of National Opera is is like a man-shaped nature oasis in the middle of city's hustle. It has a beautiful fontain (made as a sculpture) in small pond, flower plantations, decorative shrubs and trees. BASTEJKALNS PARK. Bastejkalns, an artifical hill made in 19th Century and Riga canal which flows next to it, is a green, romantic environment where to feel the breath of nature. Winding paths, larger and smaller bridges, water cascade, by-passing boats (in summer) makes it a great place to relax. KRONVALDA PARK. The main attraction in Kronvalda park is the largest fountain in Riga which is also presented as the first interactive fountain in Europe. Every by-passer can regulate the fountain's water flow with his hand movements. In the dark time of day, fountain shines in lights of 7 different colors. ZIEDONDARZA PARK. Recently restored beautiful and well-functioning park in Riga centre eastern part with a historical fountain, cobblestoned paths, sports fields, grass lawns, many benches and night lighting. UZVARAS PARK. The largest park in Riga (30 ha) boasts not only with it's vast space for physical activities (running, rollerskating, skiing, etc.) but also first sakura plantations in the city. There is also a soviet-built Victory monument devoted to USSR victory over Nazi Germany in WW2. ZIEMELBLAZMA PARK. French style park surrounding Ziemelblazma culture palace, dates back from 1903. In recent years it has been restored, making the place as one of the most beautiful green landscapes in Riga. MEZAPARKS. Mezaparks is somewhere between a park and a wild nature - basically it's a forest with paved asphalt paths. There is also largest open air stage in Latvia, Zoological garden and Kisezers lake near by. ETHNOGRAPHIC OPEN AIR MUSEUM. In another pine forest next to another lake (Jugla lake), there is a rich and interesting collection of old, traditional buildings from all regions of Latvia. The place to become acquainted with authentic architecture traditions of Latvian countryside. ST PETER'S CHURCH TOWER. St Peter's church offers an observation platform (accesible by an elevator) at the height of 72 meters. It's located right in the middle of city thus provides centrally located panorama point to whole Riga. Ticket is expensive - 9 EUR. RADISSON BLU SKYBAR. Skyline bar at the highest floor of hotel Radisson Blu offers probably the best panorama of the city, including boulevards, Old Town and all the highrises in one view. The view is seen through windows so the reflections of lights are sometimes disturbing. SCIENCE ACADEMY OBSERVATION PLATFORM. Another great view point - the centre is visible from southern side with excellent perspective to Central market, Daugava river, National library, Railway bridge and Old Town. Individual adult ticket costs 5 EUR. TV TOWER OBSERVATION DECK. Riga TV Tower offers great panoramic views from it's 97 m observation deck - the highest publicly accesible point to see the city. Central part of Riga is a bit farther from here but visible. Ticket price not so expensive - 3,70 EUR. ALBERT HOTEL LOUNGE BAR. 11th floor of Alberta hotel provides a lower but also interesting perspective - the view is well above the centre buildings rooftops. GALLERIA RIGA ROOFTOP. Department store "Galleria Riga" rooftop is publicly accesible place to see the city from elevated perspective. Here one can spot fragmented compositions of city skyline because the roof is not high enough to offer holistic panoramas. STOCKMANN BUILDING TERRACE. Terrace on the highest floor of Stockmann (or Forum Cinemas) building offers views to Aspazijas boulevard and 13th Janurary street, as well as some highrise spires sneaking above Old Town roofs. RADISSON BLU DAUGAVA PANORAMA FLOOR. Observation floor of hotel Radisson Blu Daugava offers the view of city skyline with Old Town in centre, from 10th floor perspective. NATIONAL LIBRARY. Reading rooms in each floor of Latvian National library has windows with a views to centre and Old Town. However only registered readers can access these floors. There is also a special panorama deck in highest floor, but rather unusable because of many small black dots on the window glass. VIEWS FROM BALASTA DAM. Riverside at Ķīpsala island is offering some of the most beautiful views to Riga Old Town’s skyline. Due to arcuated shoreline Riga skyline is dynamically changing here - just a few steps and you see yet another composition of medieval church spires. VIEWS FROM DZEGUZKALNS HILL. Dzeguzkalns hill offers several view corridors to Old Riga and some other parts of the city from around 5 kilometres distance in Ilguciems district. VIEWS FROM VANSU BRIDGE. Vansu bridge let to approach Old Town slowly and to observe various compositions of it's skyline spires. VIEWS FROM DAUGAVA WATERFRONT AT SWEDBANK. One of the most classical views of Riga skyline is seen from Daugava waterfront next to Swedbank building. 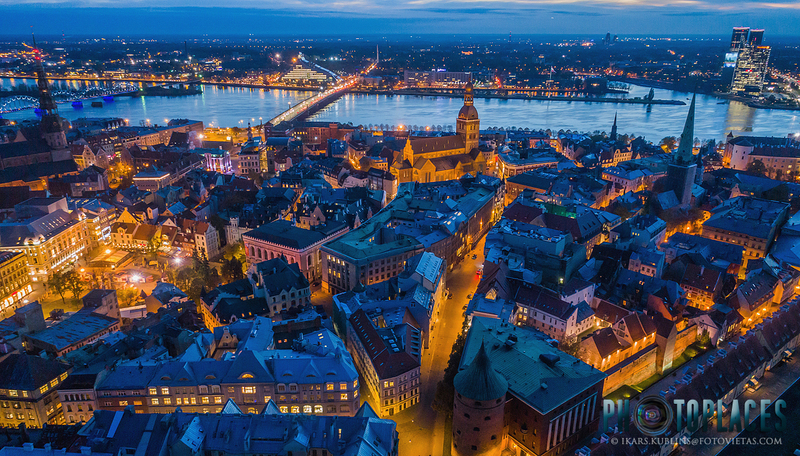 Many food products of Latvia, from chocolate sweets to sprats in oil have presented themselves with this panorama of Riga. VIEWS FROM AKMENS BRIDGE. Akmens bridge offers a rather unique sight - it's the best perspective to both Old Town and modern buildings on the left bank seen together in one composition. To the other side from the bridge there is also interesting view with Railway bridge, Central market and National library. VIEWS FROM AB DAM. Another place of classic skylines of Riga. Old Town is directly opposite to this place thus the panoramas are much more stretched than from Balasta dam or Vansu bridge.